This is probably the best pub Marlow has to offer. But it's a fair way out of town and up a big hill. The Rebellion Brewery is just down the road. We went there afterwards and it was doing a roaring trade. 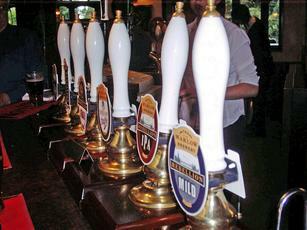 But the Three Horseshoes predictably had a good range of ales from them - IPA, Smuggler, Zebedee, Blonder & Saint. But I was drawn more to the sight of a real cider, a rare sight indeed in these parts and the only pub of 13 I tried in Buckinghamshire over the course of the weekend to stock one. It was Old Rosie, but felt like striking gold. There were very few customers in here. All were drinkers. Judging by Snarling Mallard's review, it probably gets much busier when food is being served. Nice enough place and worthy of a 7/10 as pub of the day. More restaurant then pub. Only a small drinker's area by the entrance. I didn't rate the beer much but I was comparing it to the brewery 'pull your own pint' offering from the open afternoon down the road so am probably being over critical. Dropped in here for lunch. Nice place with good food and an excellent selection of beers from the local Rebellion brewery. Service friendly too. 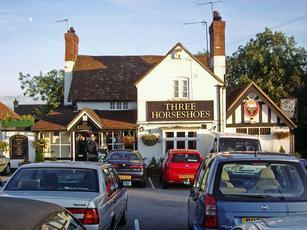 A walk from Bourne End to Marlow via Flackwell Heath enabled us to make a lunch stop at the Three Horseshoes. And what an excellent place it is. A bit of a restaurant to be sure, but to be greeted by a row of handpumps all selling Rebellion beer is a sight to behold. I plumped for the Roasted Nuts at 4.7% and jolly fine it was too. No-one of us was alcoholically disappointed. And the food was pretty good too. An extensive menu, but to get that pub feel we would recommend the Horseshoe Breakfast, an all-day breakfast forming a veritable food mountain on the plate, all for a mere £8.95. All in all, a spot on alehouse. Now, how can I find an excuse to return ? 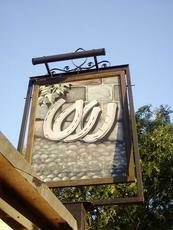 Large pub on the old road between Handy Cross and Marlow. Interior is mostly given over to eating but unlike many pubs you won't feel uncomfortable if you just want a pint. The beers are all from Rebellion Brewery and kept with almost obsessive care. Unsurprisingly given the quality of the beer, the place itself is always spotless. Haven't tried the food so can't comment but for a simple beer few pubs in Bucks come close.